Mexican cartels are bad and Emily Blunt is good. These are the main takeaways from the generic sequel Sicario: Day of the Soldado, which serves only as an overlong, unnecessary reminder of how gripping Denis Villeneuve’s 2015 predecessor was. This continuation of the story that follows government agents embroiled in the drug war jettisons Blunt’s audience surrogate character from the first movie, leaving a hole that returning screenwriter Taylor Sheridan can’t figure out how to fill. Blunt was the best thing about Villeneuve’s “Sicario,” delivering a brilliant performance that persistently probed the morally murky material and provided a pair of eyes through which we could view the events in questioning horror. Blunt’s absence translates to increased levels of testosterone in Sicario: Day of the Soldado and removes the moral quandary element from the equation, lending the sequel a stale flavor that director Stefano Sollima chokes down with a meaningless expression. Less is the suffix of the day when it comes to this movie. It’s Blunt-less, formless, pointless. Gone is the taut intensity of Villeneuve’s set pieces, such as that sweat-inducing nighttime raid of a cartel-controlled tunnel that likely left marks in many a theater armrest. This time around, it all feels like a retread, only without the deep-set sense of fear permeating every frame. There are several subplots again, except now they’re lacking the glue that was Blunt’s Kate Macer to hold the whole thing together. Instead, the story is split awkwardly between FBI agent Matt Graver (Josh Brolin, “Hail, Caesar!”), who recruited Macer in the first movie, and shadowy hitman Alejandro Gillick (Benicio Del Toro, “Inherent Vice”), who brought an especially chilly air to the previous chapter. 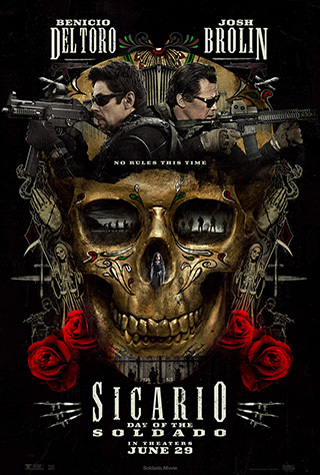 Sicario: Day of the Soldado kicks off the action with a disastrous suicide bombing inside a Kansas City grocery store that then leads the Secretary of Defense (Matthew Modine, “47 Meters Down,” enjoying a career resurgence that has now reached peak head-scratching levels) to let Graver wage war with the gloves off. So Graver locates Gillick and the two concoct a kidnapping scheme that will allow them to zero in on the head of a major cartel. Their extraction target is scrappy teen Isabela (Isabela Moner, who previously played an Izabella in “Transformers: The Last Knight,” suggesting all young Latinas have the same name), which allows a sentimental subplot to occupy much of Gillick’s time. Del Toro’s imposing, intriguing presence remains intact, but Sheridan and Sollima’s shared attempt to pluck the heartstrings with Gillick’s tragic backstory that already had powerful closure at the end of the first film is a massive miscalculation. Villeneuve’s movie handled the anti-hero’s arc with such grace and precision that there’s not much more to be done with the character other than watch him brandish more guns and kill more people. Sheridan’s decision to appeal to the character’s softer side by making him Isabela’s protector while they travel behind enemy lines amounts to coloring the conflict with crayons. Coupling the steely murderer with a young girl is a familiar tough-guy trope this movie doesn’t need and Sollima fails to extract any moving dramatic substance from this endeavor, rendering the attempt too transparent to work. Gillick still fares better than Graver, though. Despite leading the charge early on, Brolin’s character ends up with nearly nothing to do, other than acting cool and shooting a bunch of people. He quarrels with his superiors a bit and takes various modes of transportation (special note: Brolin looks cool in a helicopter), but ultimately, he has no arc whatsoever and is only present to clumsily push the plot forward. Brolin is solid in the role, of course, but after his big, loud turns in recent blockbusters “Avengers: Infinity War” and “Deadpool 2,” it’s easy to feel the pangs of Brolin fatigue. With the script using him so mechanically here, his performance is predictably one-note. Another familiar face, that of Catherine Keener (“Get Out”), is given even less to do, so it’s all relative in terms of how wasted much of the cast is. Beyond the bland filmmaking here, it’s difficult to ignore how different a world this movie has been released in compared to the one in which the first arrived three years ago. A crude, violent, amoral action-thriller about migrants being trafficked by monsters over the U.S./Mexico border feels especially ugly and insensitive considering the real-life events that are currently unfolding. Of course, it’s not fair to suggest that Sheridan and Sollima should have possessed the foresight to know what the actual Presidential Administration would be doing right around the time their movie was opening in theaters, but the facts inevitably dilute the fiction. It doesn’t help that this sequel relies on convenient coincidences to patch together the subplots, making a certain suspension of disbelief an unfortunate necessity. What little works in Sicario: Day of the Soldado still falls short of its equivalent in the first movie, so while the photography is decent and the score appropriately ominous, both fall short of the stunning imagery and eerie aural activity present in Villeneuve’s movie. It’s forgivable that the sequel is not as amazing as the original, but it’s frustrating that this chapter never really justifies its existence beyond the usual Hollywood hopes of growing a franchise. We’ve been down this road before, except now it’s dustier and the destination can only be glimpsed hazily in the distance. There’s a sense of cyclical fate in Sicario: Day of the Soldado, emerging as one of the movie’s main themes, but that hardly justifies how the quality of the overarching storytelling has been so diminished from one movie to the next. While Villeneuve’s movie left little room for improvement, Sollima’s sequel never comes close to matching any of its predecessor’s power, meaning this series hasn’t even stayed static, instead taking several steps backwards. As for how to fix this in time for the inevitable third movie, Emily Blunt probably has the answer.